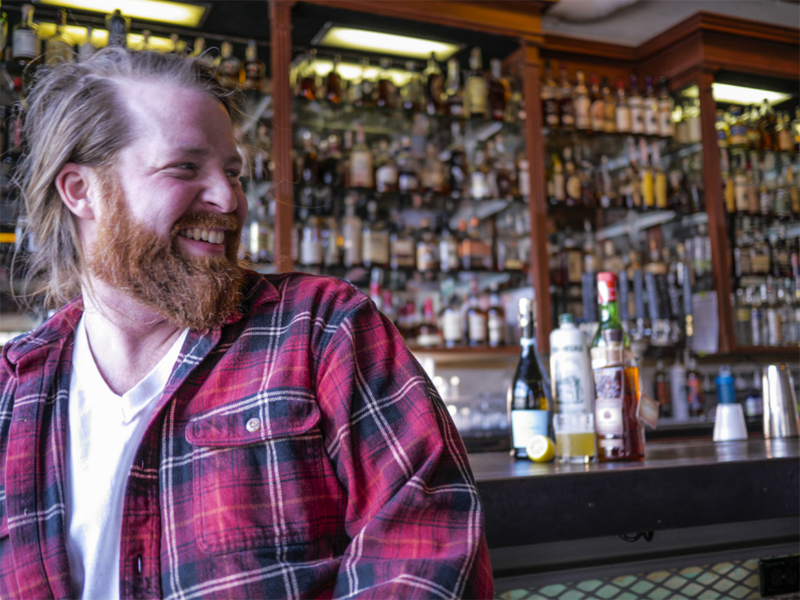 Mixologists take pride in the cocktails and beverages that they serve, including our friend Jeremy Salmon, of Louisville’s Garage Bar. If that name sounds familiar, it’s because he’s our Nuludays Cocktail Competition winner. Straight up/neat. It depends on the time of year or what I’m doing, but I usually drink it neat at home. Are you originally from Kentucky? What do you love about our state? I’m not. I moved a lot when I was a kid, but I ended up in Winchester, Tennessee. I moved up here to finish school and just stuck around. What do I love about Kentucky? I love living in a rural-type state. I love the open air and having nature right there in my fingertips. I love having four seasons, and I love the fact that there’s a bourbon culture here. And I really love the old southern culture. How long have you worked at Garage Bar? I thought of how I like to drink bourbon – neat – and how I can incorporate the flavors of Christmas. I like it because while you can get some of the Christmas flavors when you sip it, this cocktail really allows the Bourbon to shine. How do you choose which Bourbon for which cocktail? I usually just ask people what they prefer. If they don’t have a preference, I ask customers what they like…spice tones, caramel flavors, etc. I also sometimes ask people if they haven’t tried something before and if they want to try something new. It’s somewhat important. It really depends on the drink. So long as its not a super thick glass or really small, it’s okay. I’m more of a basic, simple person, though I do think you can enhance flavor aromas depending on the type of glass. So basically, while it is important, I don’t find it super critical. You’re at home. It’s time for a nightcap. What are you having? Do I already have something in the house? If I’ve already got something, that’s what I’m drinking. But typically I’ll drink something that’s inexpensive but good, so something like Four Roses Bourbon. What do you make a person who isn’t from Kentucky? That’s part of the craft. I love talking to a customer and finding out what they want. I’ll ask them questions and try to create something that fits what they’re looking for. A lot of times, I’ll let customers try the Bourbon before I put it into their cocktail so they can really taste the product. At work, what’s the cocktail you enjoy making the most? Honestly? Nothing ordinary. I enjoy making something I’ve never made before…maybe that’s something that doesn’t even exist.